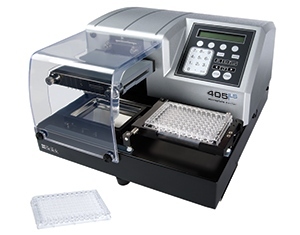 The 405™ LS Microplate Washer is the fifth generation BioTek washer, known for superior performance and reliability. Built-in automated buffer switching and "quick-change" manifold designs provide improved ease of use and efficiency when washing 96 and 384 well microplates. Washer maintenance is critical for excellent assay performance, and the 405 LS now offers the new patented* Verify™ Technology for clog detection and patent-pending Ultrasonic Advantage™ for automated manifold cleaning, making the 405 LS a truly 'self-maintaining' system. The 405 LS has a simple user interface for creation and execution of wash, dispense, aspirate and maintenance protocols within the extensive onboard software. For use under computer control, BioTek’s LHC™ Software is available in standard and 21 CFR Part 11 compliant versions. The optional BioStack™ is available for walk-away automation of up to 50 microplates.